Made in two hour intervals in the daytime using an IPod Touch and the O-Snap App, this time lapse video spans every day from November 8- December 21st 2013. This was made in the house, on the windowsill. The sound effects were recorded with an Iphone in the rain in Morris Park, right where these trees are on December 23rd. Enjoy the movie! 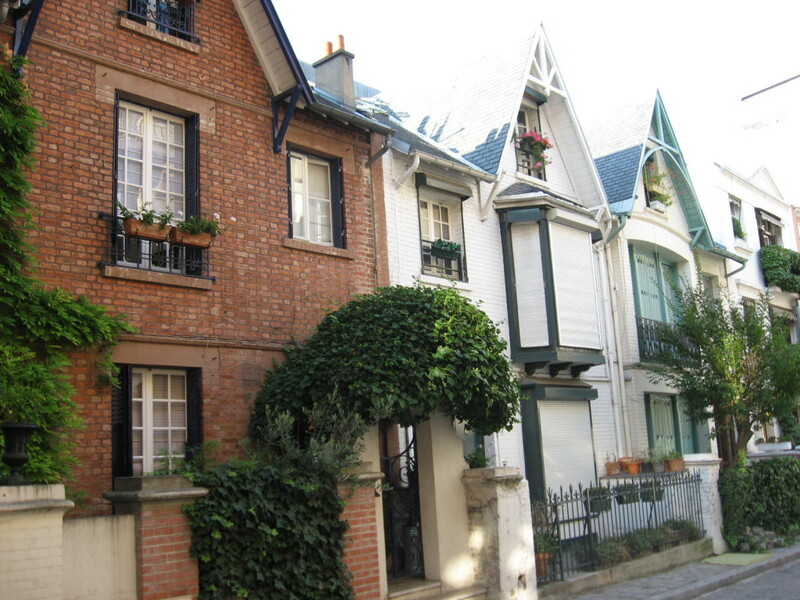 Paris gardens are varied and exquisite. 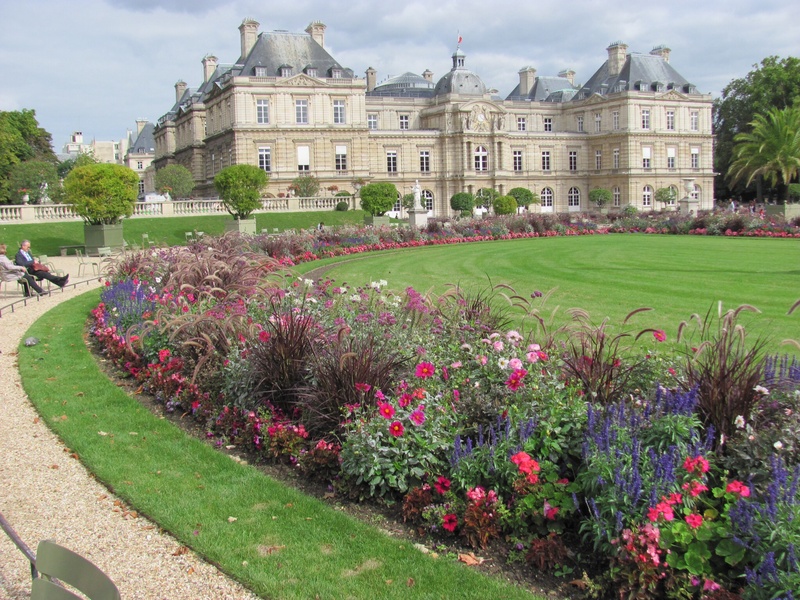 We will show you the most celebrated, such as the Luxembourg Gardens pictured in the photo above and the two below, to the most obscure, the gardens found in every niche and crevice of the Green and White City. The Luxembourg Gardens is where we start our Parisian adventure, laid out in front of the French Senate, this is a traditional French Garden, full of symmetry, formality and refined elegance, along with a generous welcoming spirit, endowed with lots of informal seating, recliners and outdoor furniture. This is always where we go in Paris! 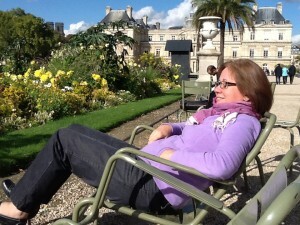 Below, Isabelle relaxes on the outdoor furniture in the Luxembourg Gardens. 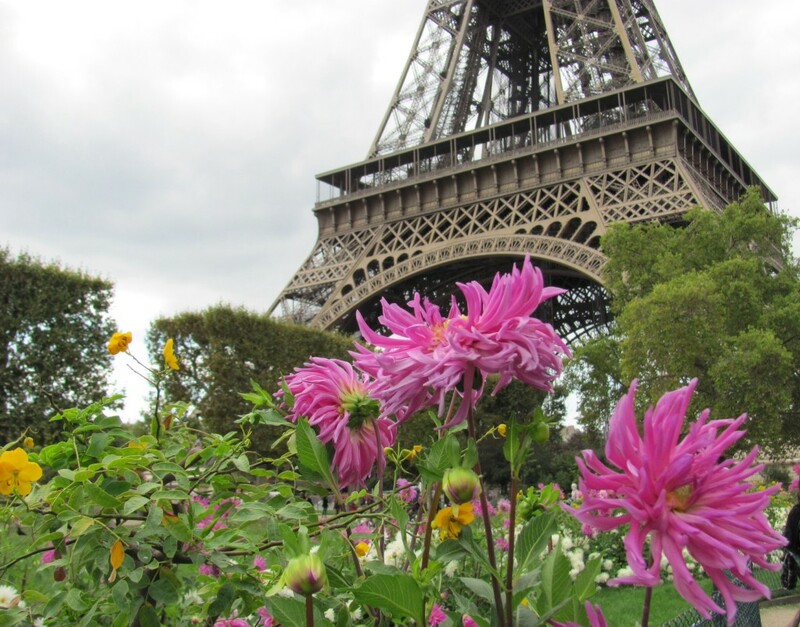 The Eiffel Tower is rendered ever more splendid with flower gardens on its perimeter. The vast spaces of the late 19th century exposition grounds are ripe places for fitting in gardens and cozy spaces to enjoy alongside the world’s greatest iron icon. 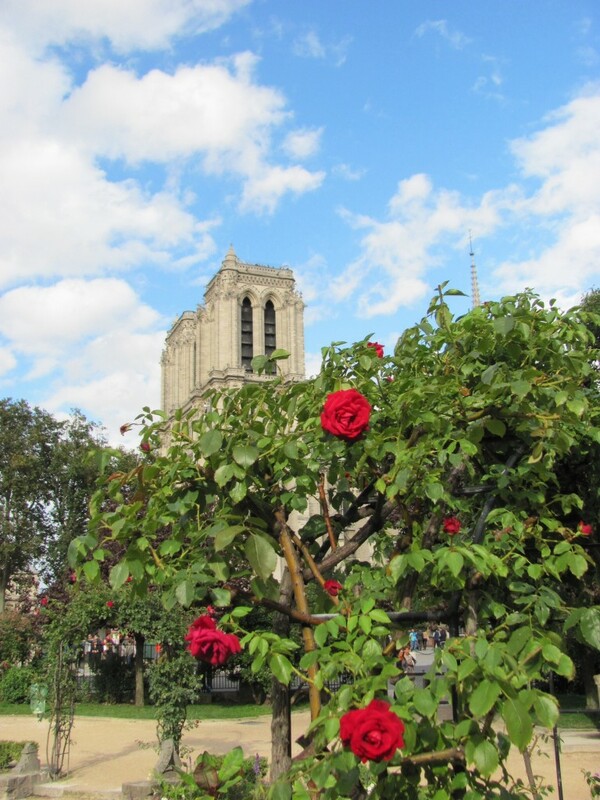 Of course, when you are done admiring these roses, it may be fitting to visit that gothic stone edifice in the background, Notre Dame Cathedral. 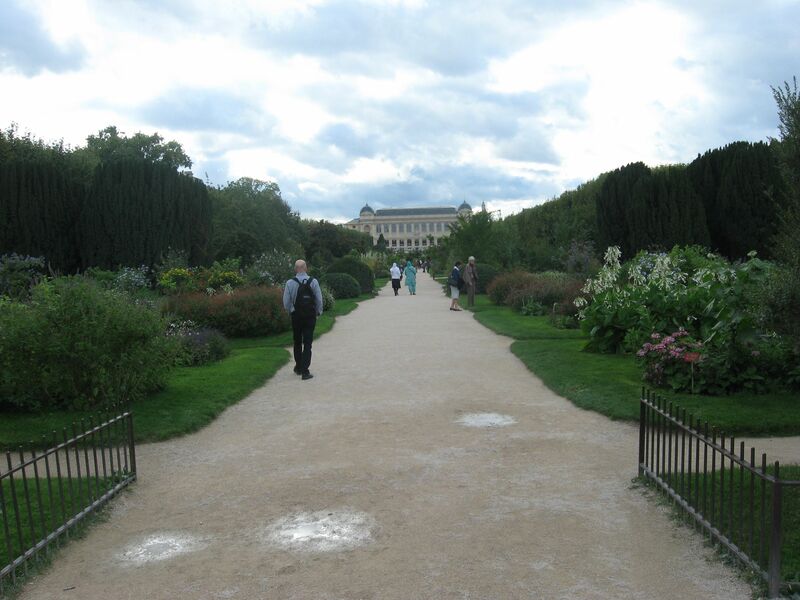 This below, is the magnificent garden alongside and in the back. We have our own bench here, where we can be found eating our bagged lunch on sunny days and if the weather is inclement, we prefer the nearby top-floor cafeteria of the Bazar de l’Hôtel de Ville, a grand multi-level department store commonly called the BHV, where we get a spectacular view of the magnificent City Hall of Paris, the Hôtel DeVille. 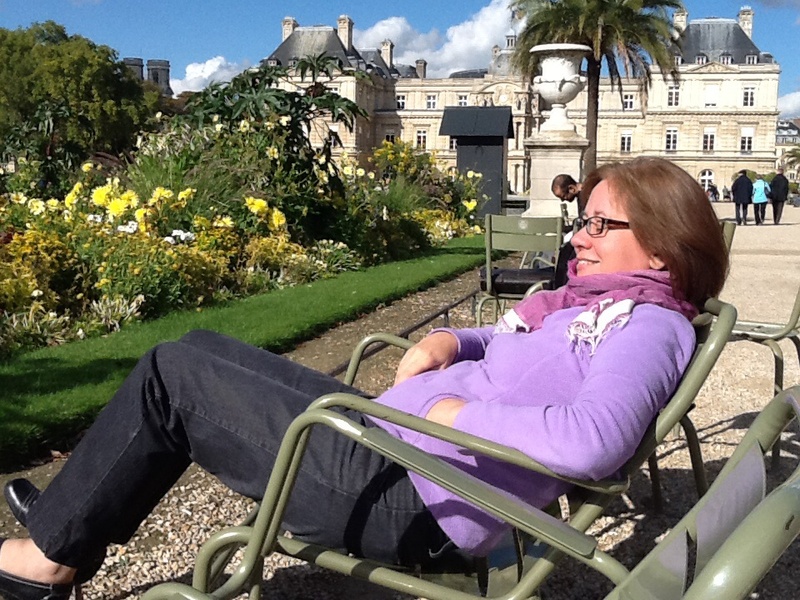 The Gardens behind Notre Dame Cathedral feature a wifi Hotspot called Paris Wifi, very friendly pigeons (especially if you have a lunch), some quiet and plenty of sun and shade. 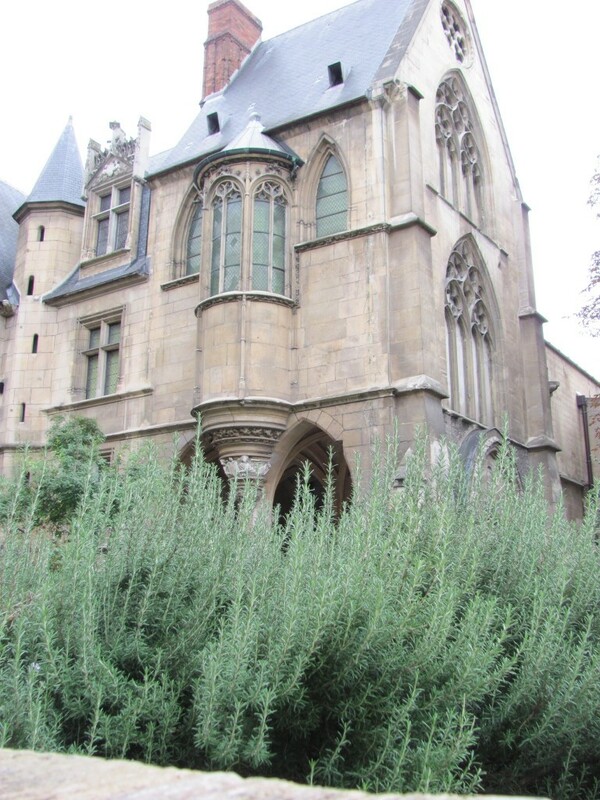 Across the Seine from Notre Dame Cathedral is the Musée national du Moyen Age, the National Museum of The Middle Ages (formerly known as the Cluny Museum), featuring an herb and vegetable garden, enclosed in a secluded and tranquil yard. Rosemary and Sage are growing alongside tomatoes and squash next to this medieval building with the remnants of a Roman Bath inside. 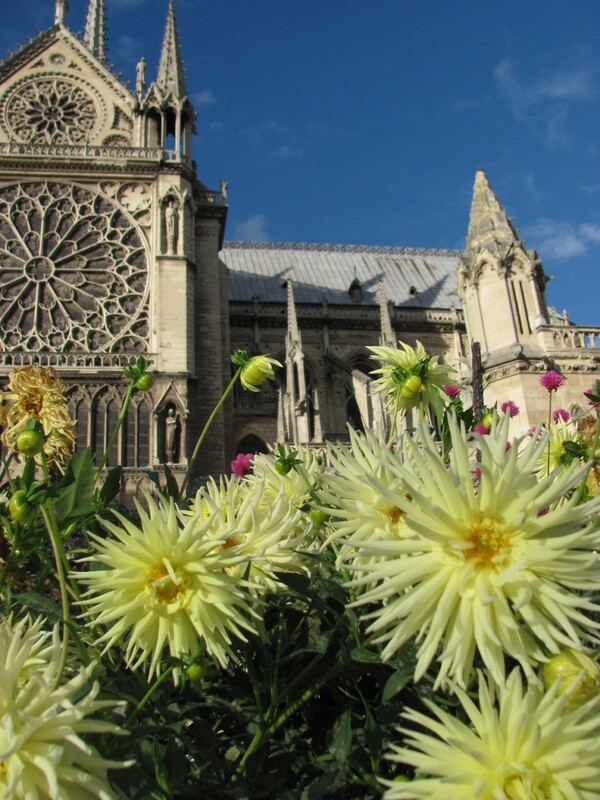 The Garden and the museum complement each other, as does the museum complements The Notre Dame Cathedral, as it contains a stunning collection of statuary and missing pieces of Notre Dame. Many of these statues were busted off during the French Revolution, and some tossed into the River Seine, and some used as foundation stones for new buildings later excavated, and some found buried below streets nearby. Many of these herbs growing here grow naturally along the Mediterranean sea in the South of France. 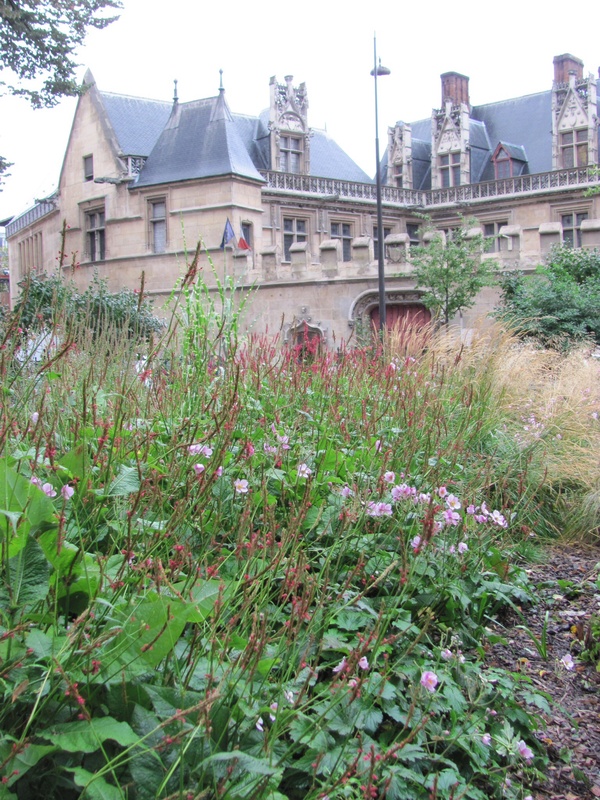 Across the street from the Musee du Moyen Age is an informal garden featuring grasses. If you appreciate the vast collection of art in the Louvre, the medieval tapestries and paintings here will further enrich your Parisian experience, as they are on display in such an appropriate setting! The gardens surrounding the Musee du Moyen Age create the atmosphere and set the mood. 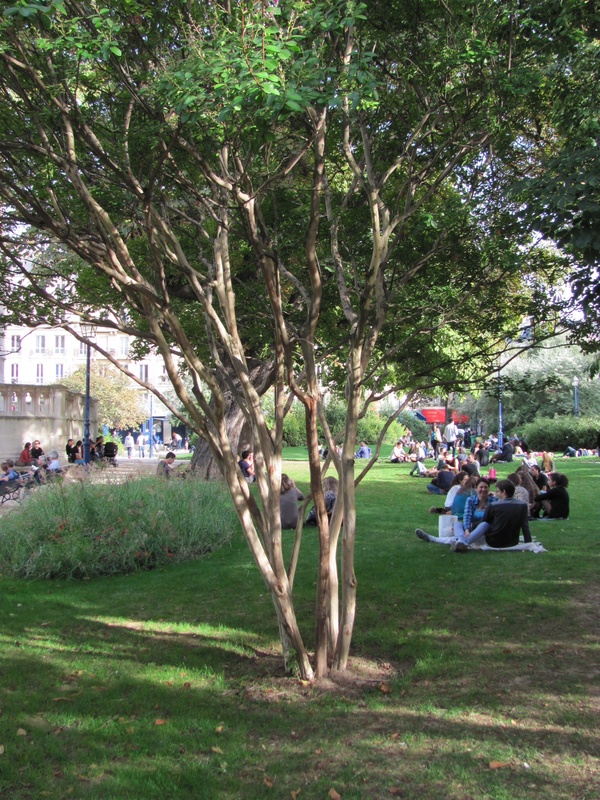 Our next adventure, below, we are at the Parc de la Tour Saint-Jacques, a very popular, centrally located patch of lush green lawns and generous plantings of shrubs and trees. 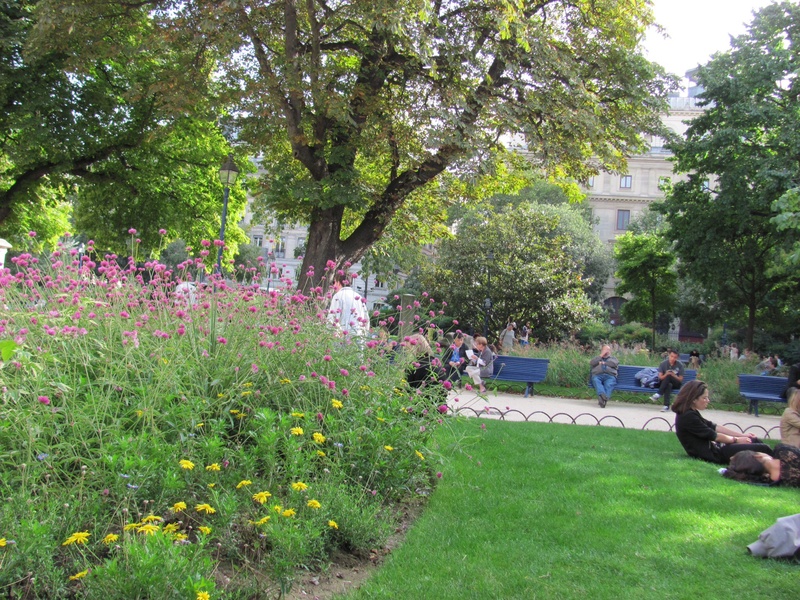 In many parks around Paris, sitting on the grass is regulated or just off limits altogether. 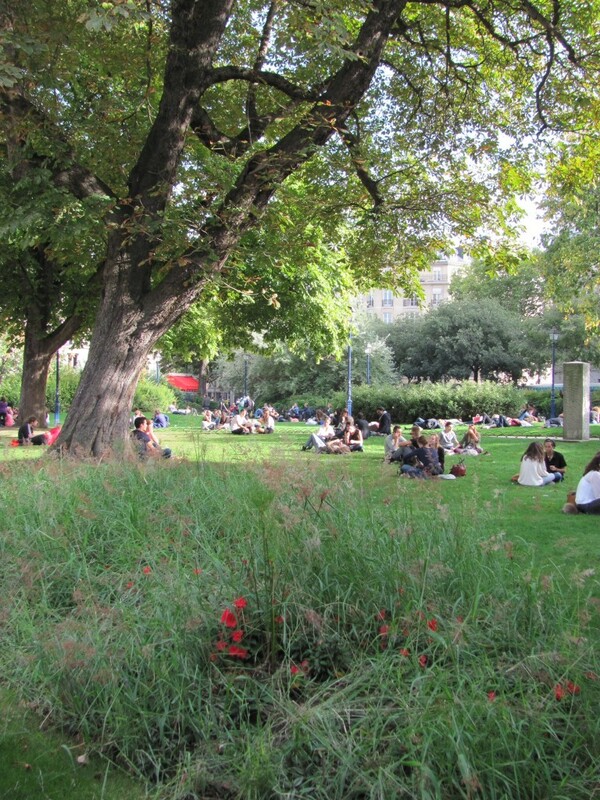 When the grass is opened up for sitting, Parisians flock to it, soaking up the sun and greenery, enjoying it in a sumptuous manner. 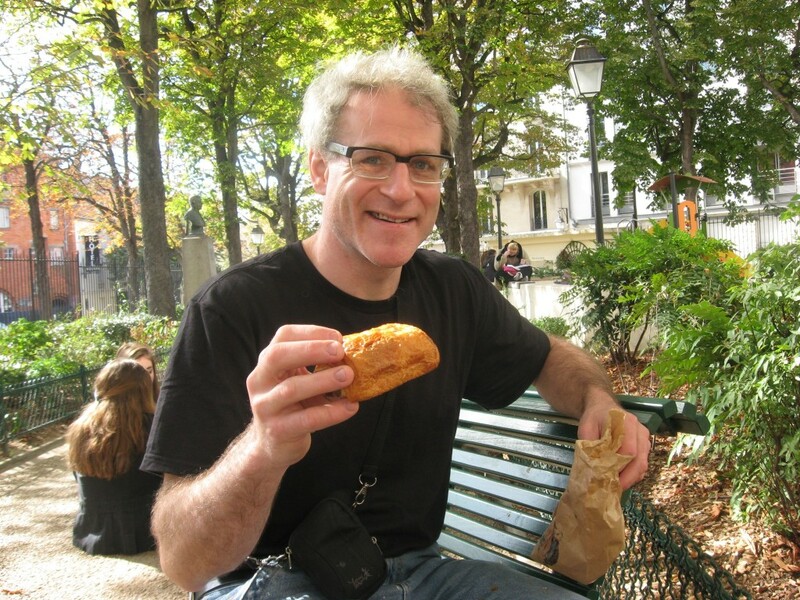 After walking around Paris all day, it is nice for us to flop down on grass, and enjoy our grocery store bought wedge of double or triple cream Brie with our Baguette, paired with some fruit such as grapes or apples. 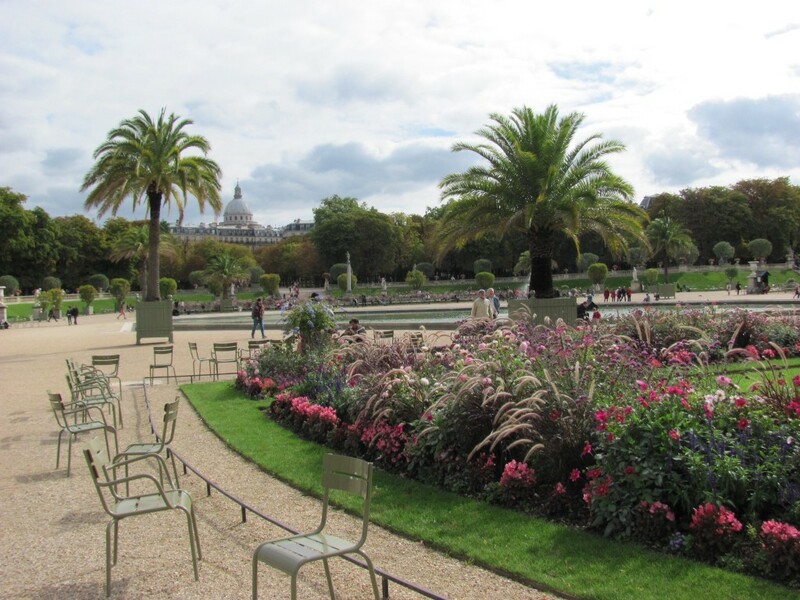 Our casual snack often readies us to continue on our adventures through Paris, and often times we find ourselves delving into the history of the city, where the Formal French Garden has its rightful place in front of the Invalides pictured below, where we have also viewed Napoleon’s Tomb. 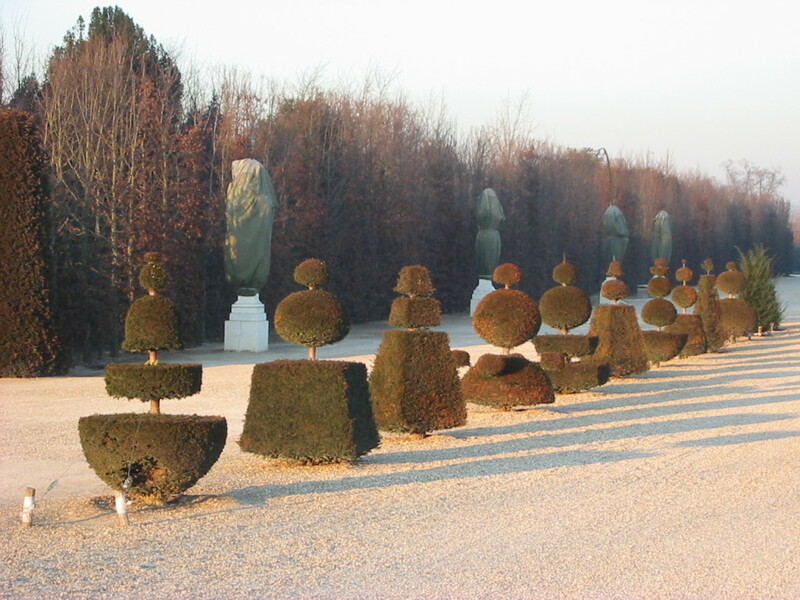 Here we discover the elegant repetition of the Topiary. Evergreen shrubs pruned into exacting shapes and spaced in a repeating pattern, leading us towards the monuments and structures of French History. We are drawn into a garden of orderliness, complemented by the windows of the surrounding buildings. These are genuinely charming historical gardens, preserving an important moment in our history with the plant world. Nature has been tamed, quantified and relegated -rendered symmetrical and organized. Maintained and refined like architecture, the natural world is made into pleasing proportions and shapes we can understand and predict, like our next meal, presented on a dish accompanied with fine silverware. Here, the French Garden is still to this day being presented to us in this manner. It is really satisfying to be served history on such a formal platter of French Gardens; here is a genuine and geographically poignant interpretation of the modern philosophical underpinnings of our botanical world view. We can shape the plant world to our will and desires and it will continue to live and green our spaces, feed us and provide us our sustenance. 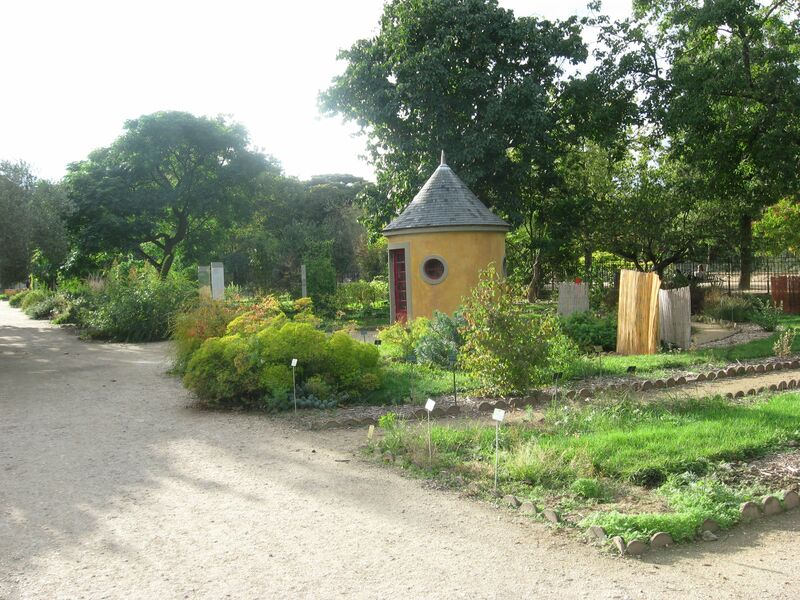 However, as we have been experiencing, the ideal French Garden is more of a historical concept, one so vulnerable to critique and has been so quickly dispensed with in the gardening fashions of the times ever since. However, because its core philosophy has endured through these trends, it is really great to see its aesthetics retained in these modern interpretations. 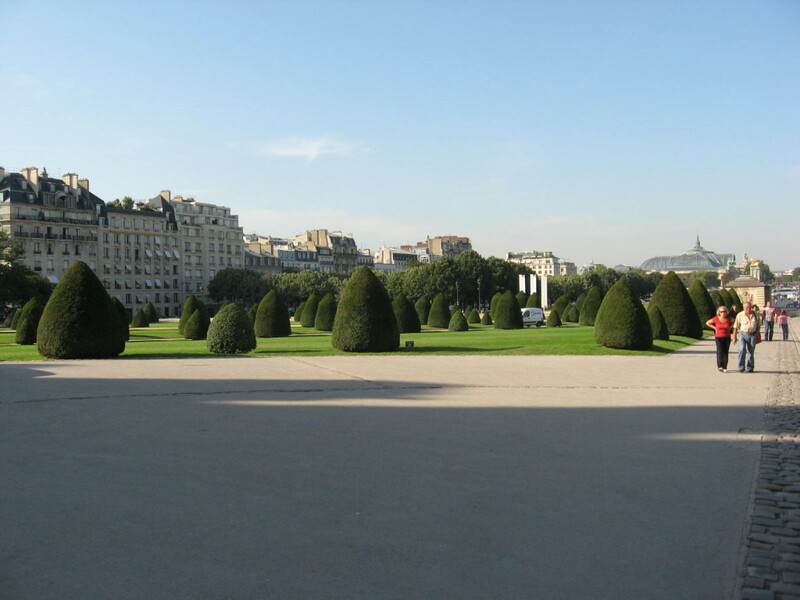 Below, The Formal Garden at the Esplanade des Invalides. 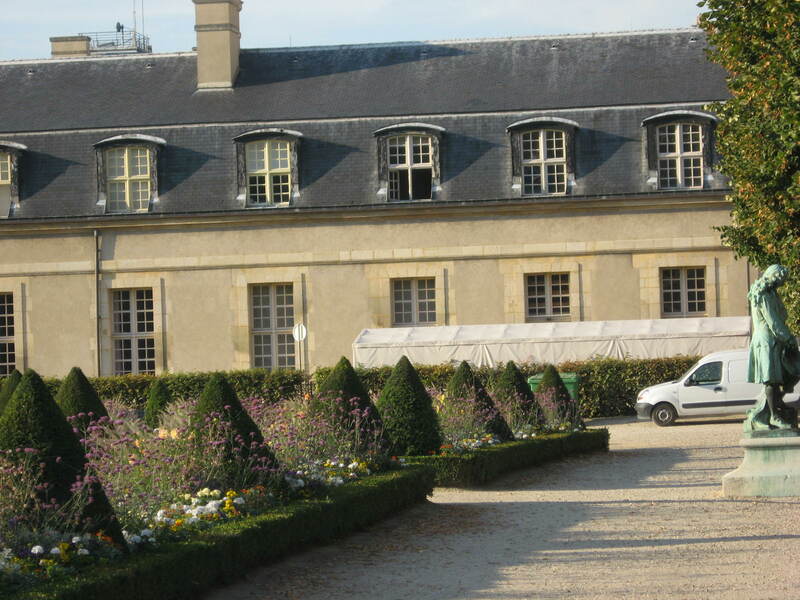 Here, the Formal Garden is at its most austere and serious- in the very front of this prominent military institution. Here the Topiary can be expressed without the need of fencing, the grass is a uniform and placid green, a picture of peace and order in the most public and high profile of locations. Here the garden is expressing a philosophical ideal, one where the ultimately cultivated garden is truly respected and cared for by all- the whole nation and its visitors voluntarily respect and revere the green perfection of this garden. And a rare sight this is in France, where most private property and public parks have fencing- tall and enclosing or short and restrictive, all guarding the use of land. Through this Garden is another unspoken notion, one of the maintainance of order and peace in a chaotic world, the dueling reality and history of political stability and freedom remain unanswered here, in this green landscape. Here, pictured below, is the accentuation of the ideal of a societal order based on the trust and respect of citizens and all visitors- the formal garden laid bare, where nature is in order with humanity and its own order and peace. 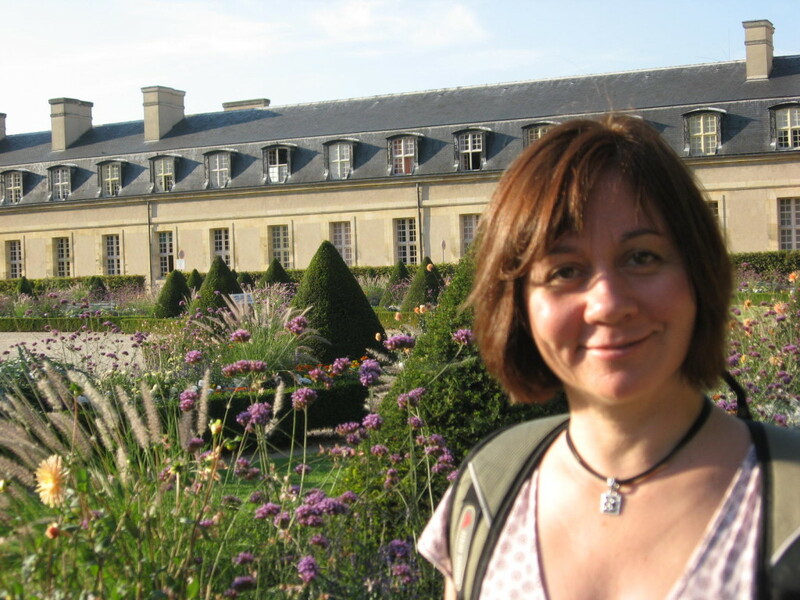 And, lastly on the French Garden topic, we find ourselves on a Christmas Season 2007 day in Versailles, where the topiary and formal gardens have also been preserved. Versailles offers a more whimsical interpretation of the cultivated nation- and -nature ideal concept. 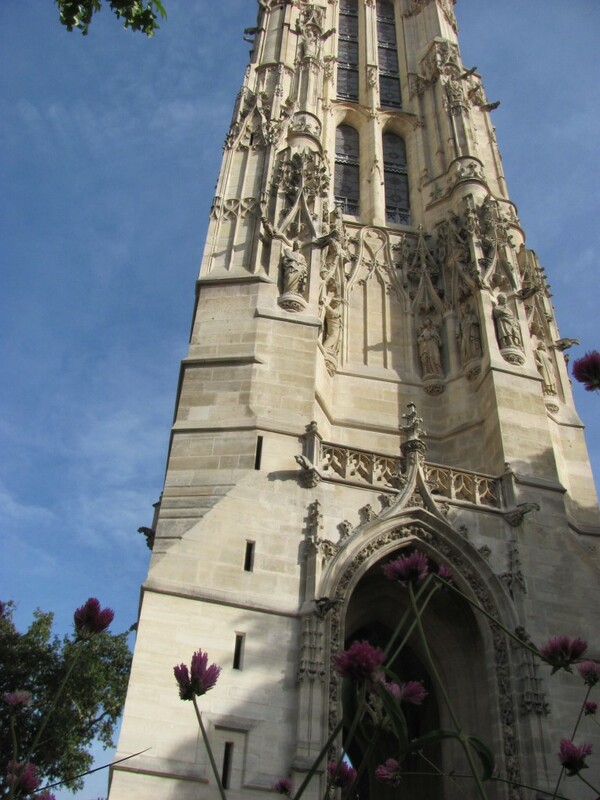 Much effort has been made to preserve this monument to France’s history, and we enjoyed every bit we saw. 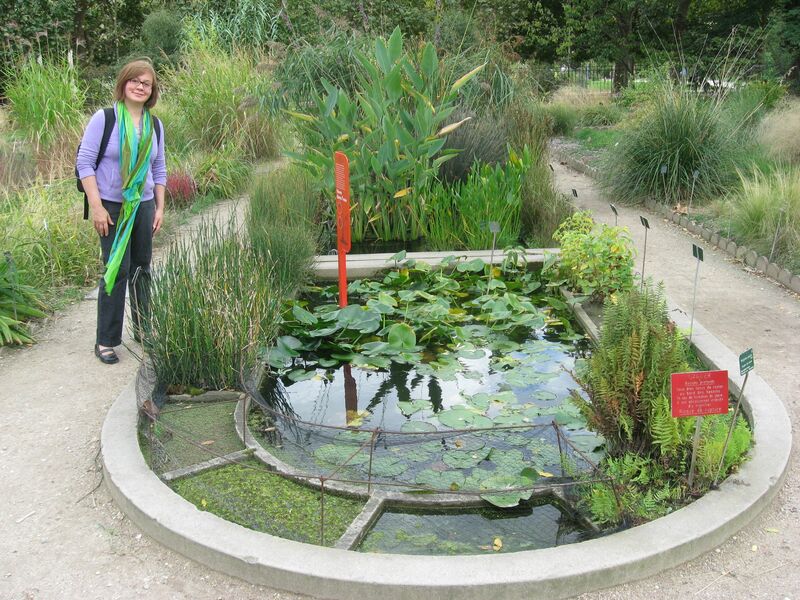 Jardin Des Plantes is a most delightful Parisian garden. This is a plant museum, complete with signage and scientific designation. 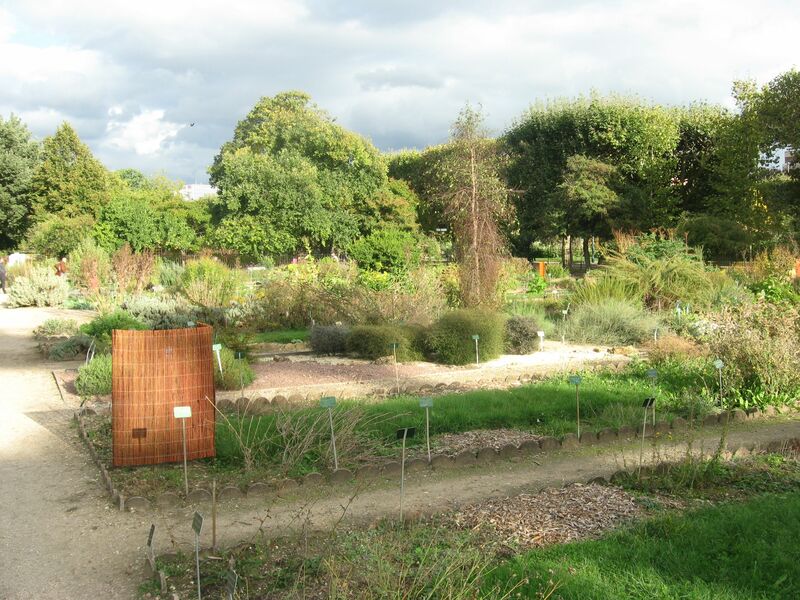 It is a vast garden, full of surprises and amazing displays. It has a formal layout in the grandest sections, all making sense and educational, where the bigger picture is pleasing to the eye, and very comfortable to view. 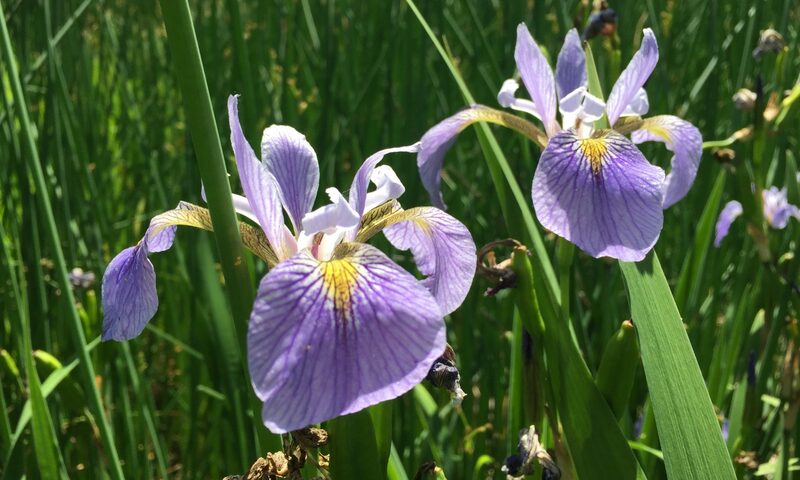 For the botanically inclined, this place is a paradise, and you may need to dedicate more time than the usual visit, because there is so much to see, and it is so thoughtfully organized and maintained. The Louvre of the Botanical world: In one day you will be awe-inspired and in one week you will just begin to appreciate the magnitude of this collection and display. This is a great place to take notes, for every plant is identified with its latin and common names, as well as its place of origin. There are special exhibits with plants arranged by color. 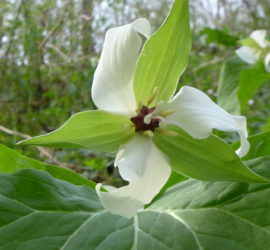 It is a great place to learn about plants and to see specimens from all over the world. There are lots of benches and an allee of London Plane trees to rest under, and of course,to have a nice lunch. Oh, and is this the cutest garden shed ever made, or what? 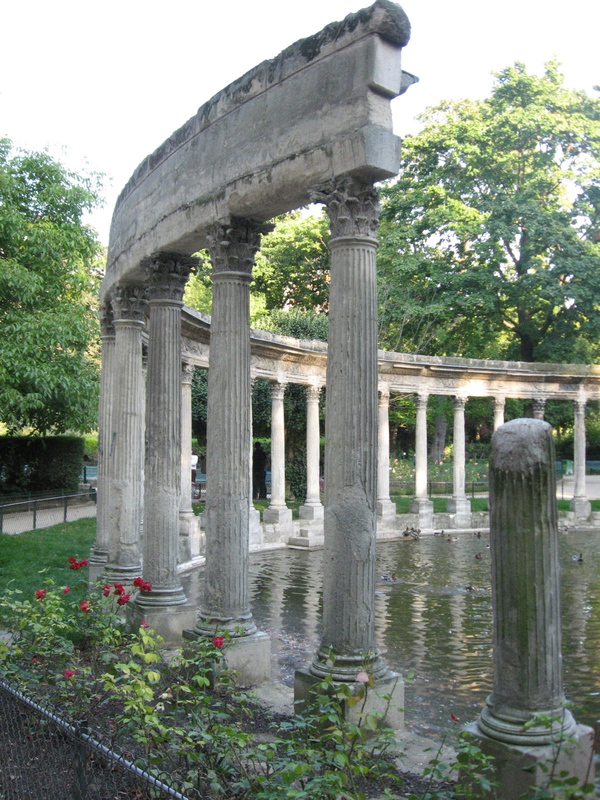 Next up, In Paris’s eighth Arrondissement is Parc Monceau, a truly eclectic neighborhood park full of odd monuments, fake ruins that are hundreds of years old and some great old trees. We stumbled upon it while wandering around one day, and Isabelle remembered it from her childhood, and we had so much fun being astonished at each truly unique weird statue and homage to the ancient world. 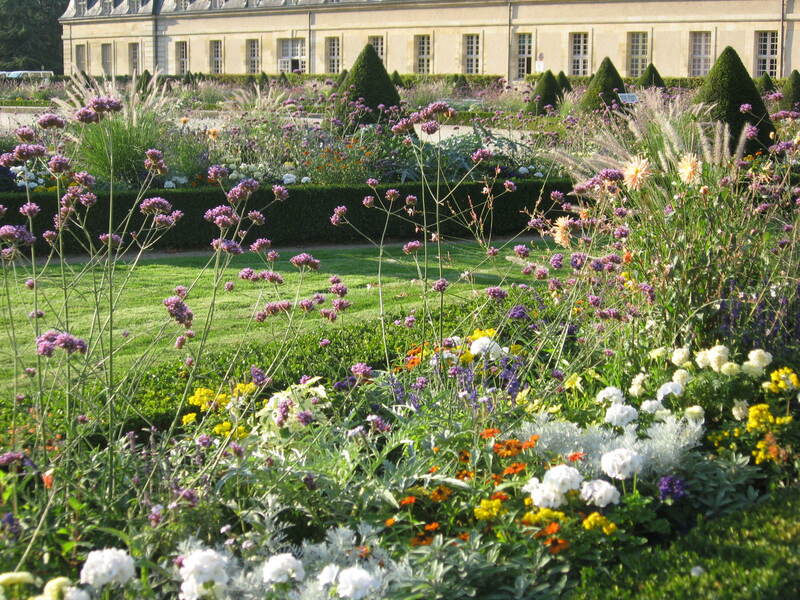 This late 18th century departure from the French Garden begins our adventure into the English-Inspired gardens of Paris. 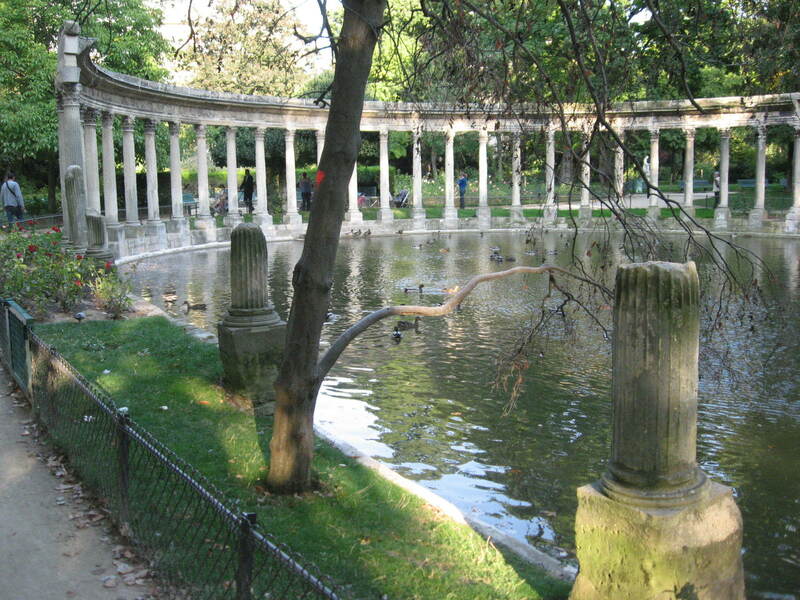 The Park has undergone many alterations, but this 1778 colonnade has survived. The initial inspiration was to display the monuments of all ages and places in a naturalistic setting. 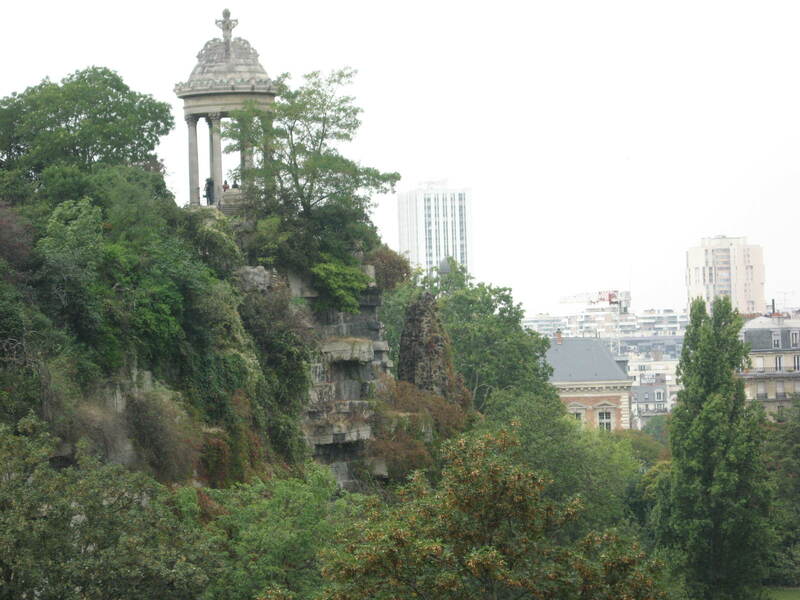 Moving right along, skipping to the 19th Arrondissement into the creations of the mid 19th century, we find ourselves visiting the Parc-Des Buttes -Chaumont, carved out of an abandoned limestone Quarry and dumping ground in the 1860s, to accommodate the needs of the growing city. 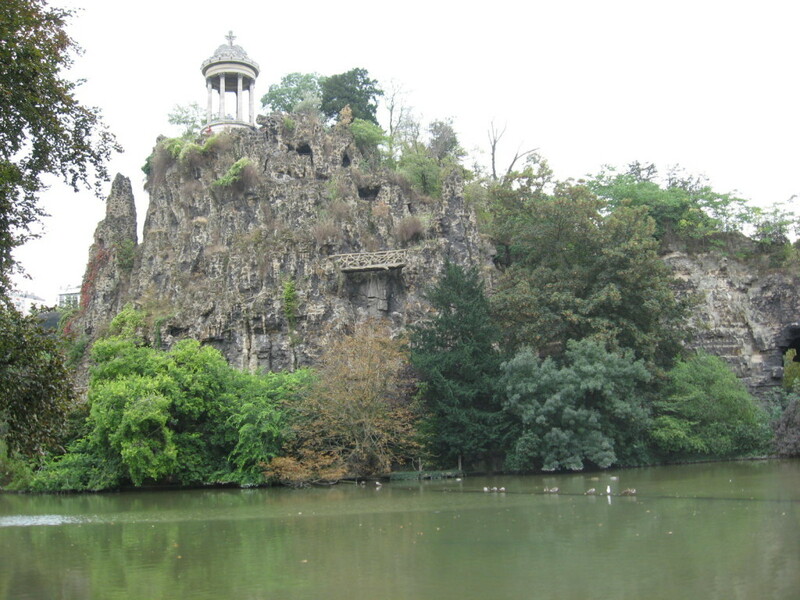 Made to imitate cliffs in an Italian setting, along with dramatic bridges, a grotto and waterfall, this park embraces the romanticism of a different time and place that Parc Monceau sought to express. The lake is artificial, but the rock cliff is a real remnant of the old quarry. What is astounding is how well the builders of this park used the remaining mined landscape to create something so grand and charming. This park is heavily used and the most popular parts are the large grassy hillsides which are great places for sunning and picnicking. So now we find ourselves wandering around the city going down streets that look interesting, always finding something. 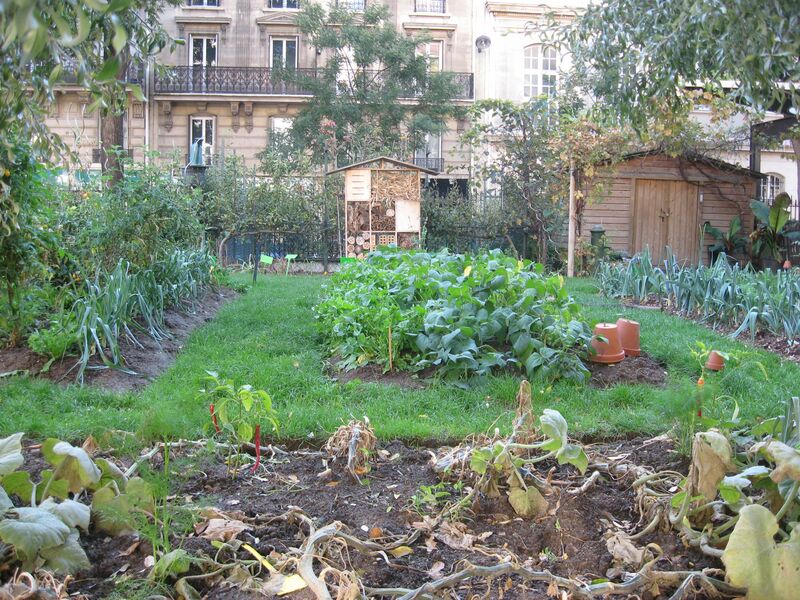 Here is a community vegetable garden, possibly along Bd Pereire not far from the Champs de Elysees. We were visiting family in this neighborhood and decided to wander around the next morning, looking for a place to find some croissants and coffee. 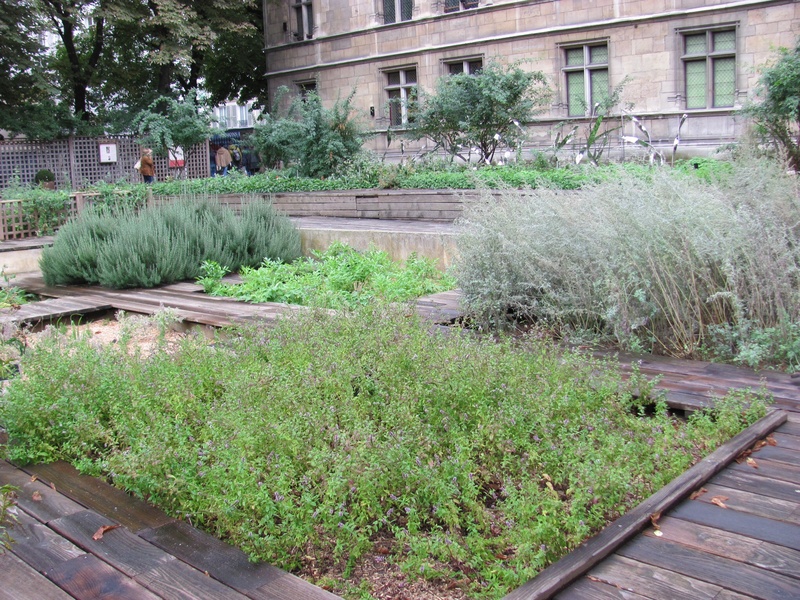 We came across this vegetable patch and it reminded us of a Philadelphia community garden. 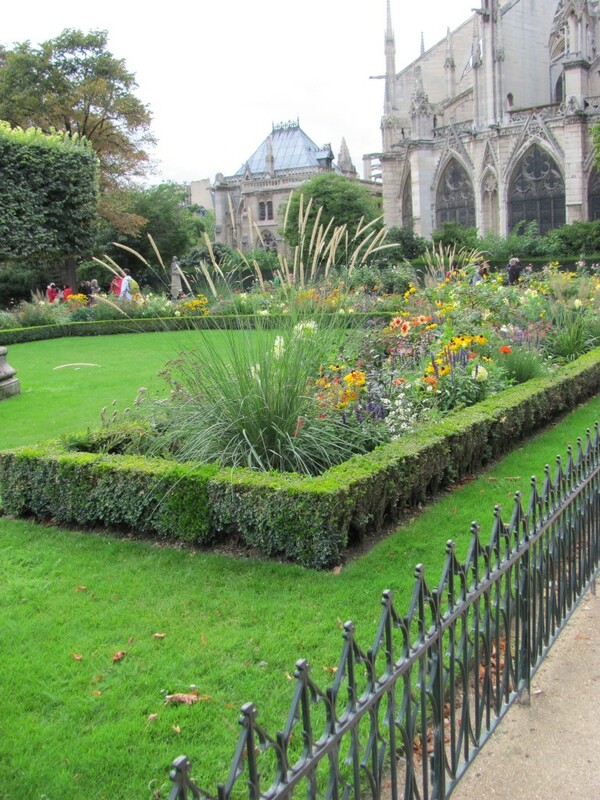 We have seen gardens like this in other areas of Paris and have met the gardeners who were very friendly and enthusiastic. 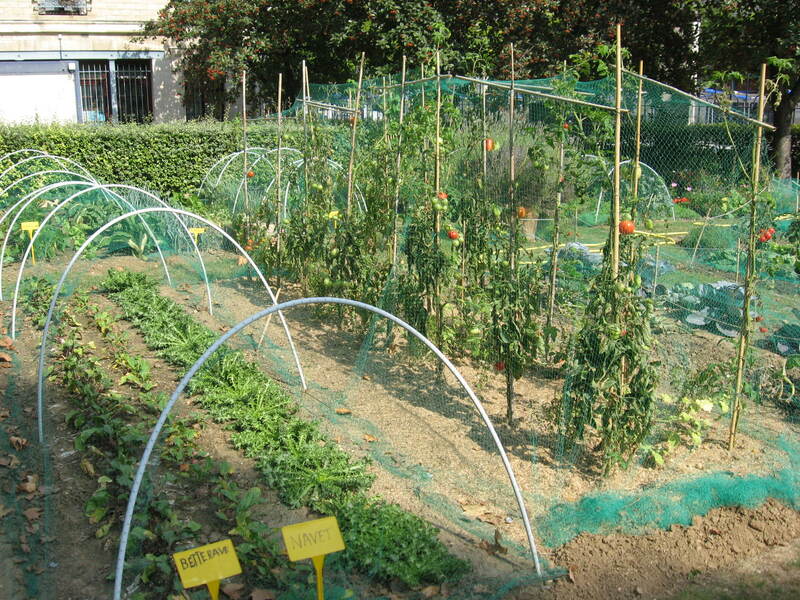 Every bit of vacant land is utilized for gardens, often enriching neighborhoods and building community. 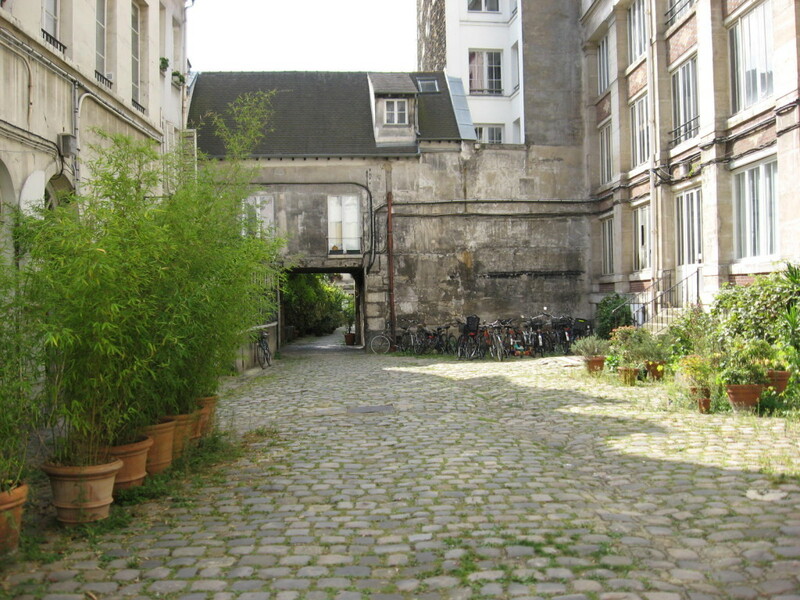 Places like these remind us how well dense cities and gardens go together. 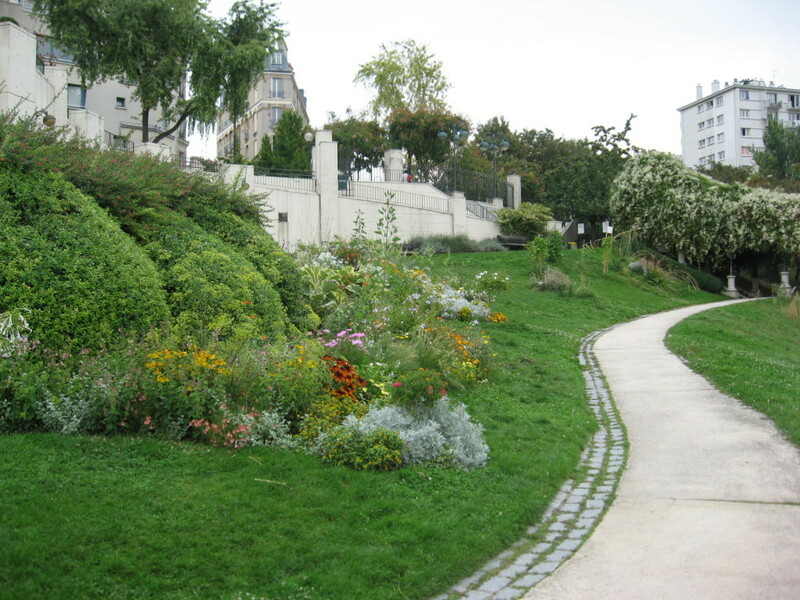 Paris could use even more gardens like this, and this thought re-enforces the notion that cities like Philadelphia, with lots of vacant land and dense housing could become very well balanced city/garden economies-landscapes. We found a great place for croissants and coffee just a few blocks away, and got there just in time, being that after we sat down to eat a line formed out the door! We ordered pain au chocolat which was a fresh croissant with a crispy outer layer, a buttery soft middle and filled with chocolate on the inside. We dipped them in our steaming coffees as we watched the neighborhood wake up and head towards the Patisserie. It was a Sunday morning and there was a lot of preparations for lunch, with loaves of bread being purchased, and people were passing by on the street with bundles of food. It is a morning like this that gives us the motivation to serendipitously zoom around Paris all afternoon. 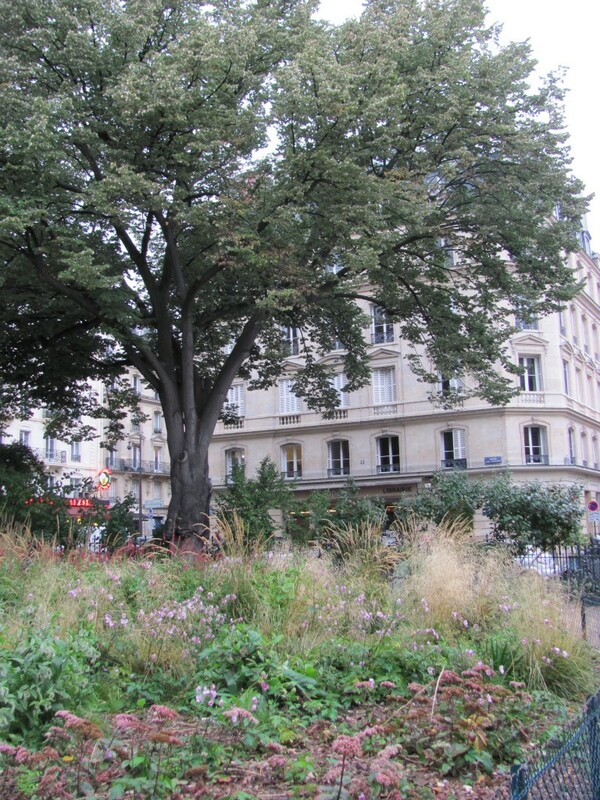 Last year while working on our most popular post Paris Street Trees, we stopped in a charming little park, pictured above in the Butte aux Cailles neighborhood, where we were staying. 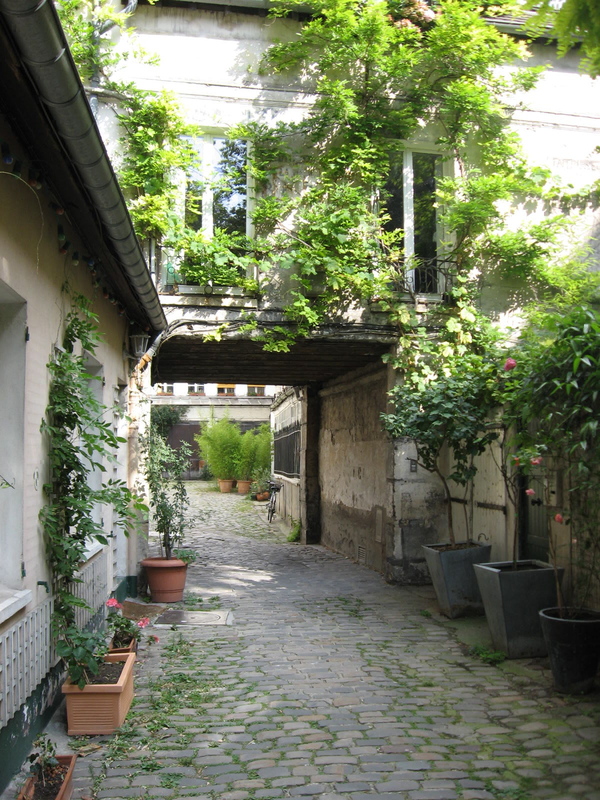 Below, an old alley, somewhere in the 12th Arrondissement has been transformed into an enchanting walkway, swept and greened. There are a lot of unloved, under utilized and under-appreciated alleys in the world, and plenty of dodgy ones as well, perhaps this one has fit into that category at some point. But now? Wow! 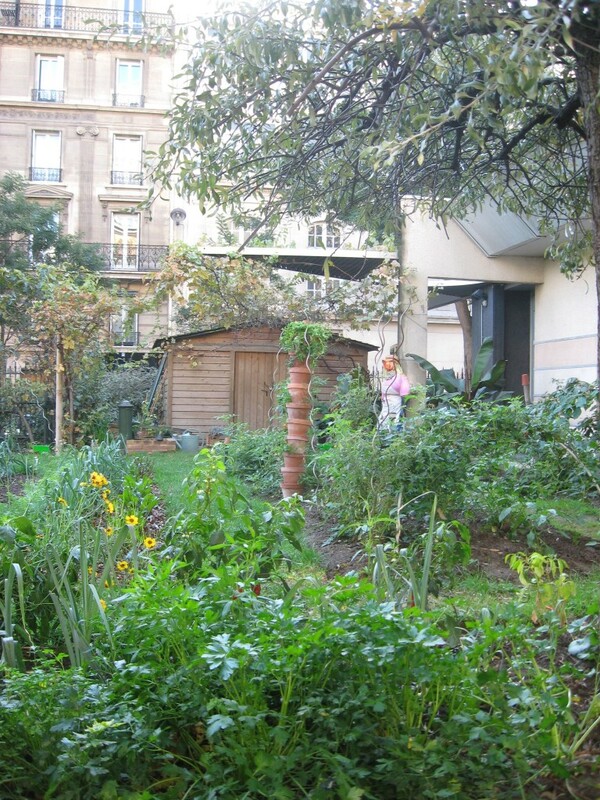 This Paris Garden needs to be emulated in many, many cities! An unlikely place for a garden to exist at all, and yet here is one that is transforming this highly dense, urbanized location into someplace walkable and pleasant. Ever so neighborly, this tidy block of tightly knit row-houses tucked away near Montmartre, proudly displays the enduring Parisian practice of gardening- every nook and cranny green and manicured. Belleville, a neighborhood quite some distance from the Eiffel Tower, pictured off on the right horizon (you can also see the Montparnasse Tower equidistant to the left in case you are wondering). 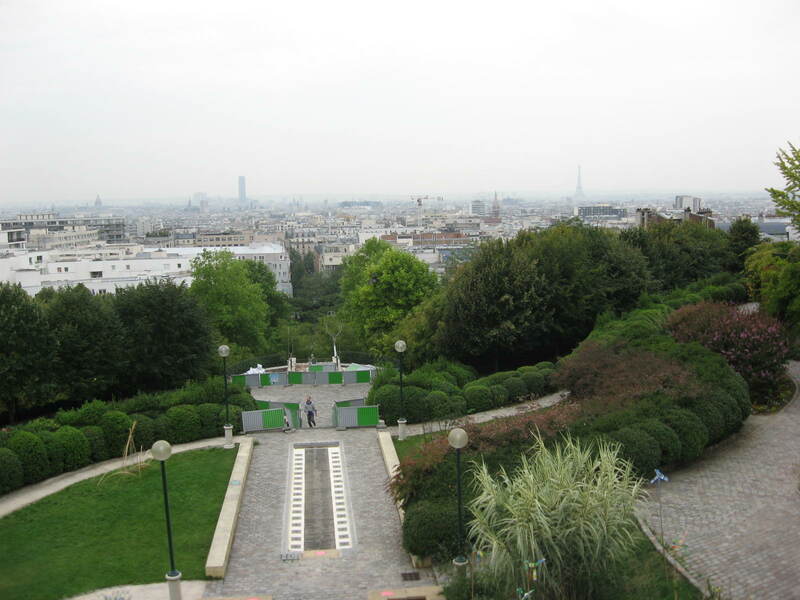 This neighborhood park, Parc de Belleville, is situated on a hill and offers some great views of Paris. It has a variety of gardens and landscapes and there is a great atmosphere about the place. There was one other garden in Belleville that escaped the camera lens, but is worth noting, this being a squatter’s garden in a vacant lot. There were political messages and images all along the fencing, full of stencils depicting a world liberated from war and heavy industry, with images of people growing plants and flowers. This garden had an old cardboard box near the entrance gate, full of bread and produce, being offered up for free to anyone in need. 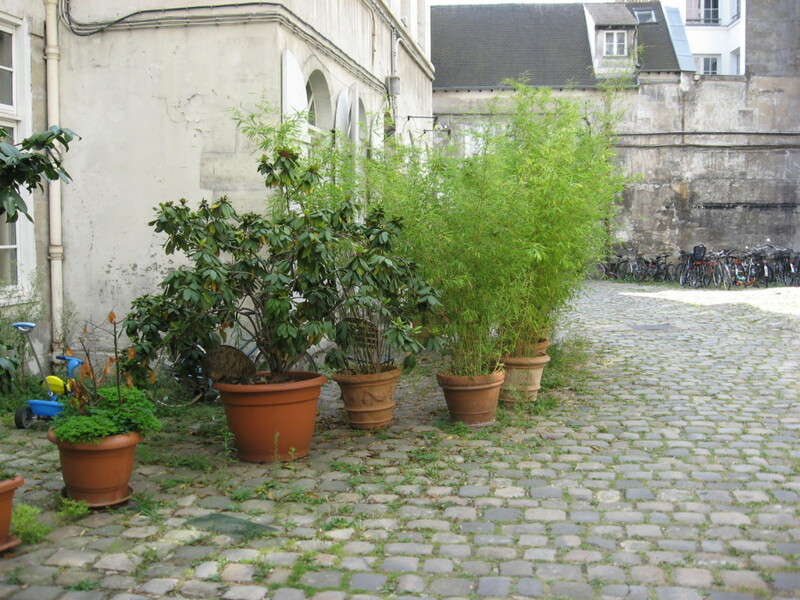 The manicured greenery looks so good among the old buildings and walls, although we are not impressed with the invasive exotics, such as the bamboo, pictured at the right. 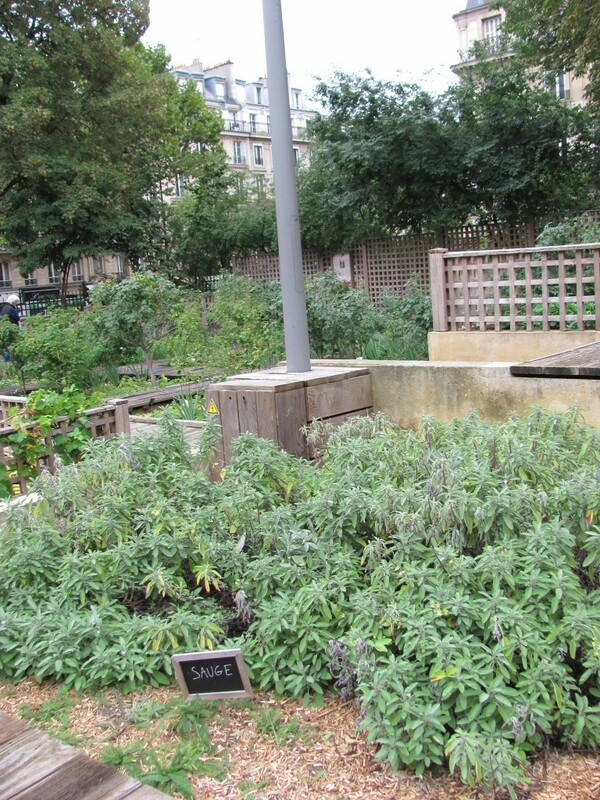 And at last we are in a community garden at the Parc Georges Brassens in the 15th Arrondissement, dedicated to the cultivation of herbs, vegetables and tomatoes, doted over and labeled to the utmost degree! In the City of Philadelphia, Pennsylvania we are struggling with land issues regarding vacant land. 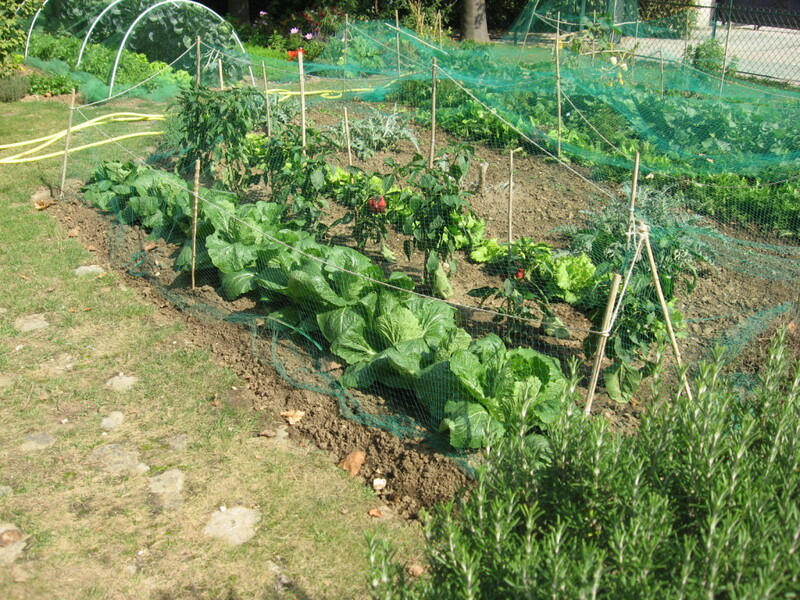 In some neighborhoods garden plots are coveted real-estate and in others it is hard to find people willing to grow a garden. Vast swaths of vacant land abound in neighborhoods often called “food deserts” where it is difficult to have access to healthy food. In our own garden, located on a vacant lot purchased for this purpose, even an hour or so of work can lead to vegetables and herbs for almost half the year. Its really all about having the land available and the desire to plant some seeds. Philadelphia as well as Paris could certainly benefit from having more gardens. Cities look so much better with cultivated plants within reach of all of their citizens. Think of a garden like this one as an urban creation, one where we live so close to such an important part of our food source, that we are able to cultivate it to such a degree of sophistication. As if it is an extension of the living spaces-bedroom, kitchen, garden, dining room, living room. 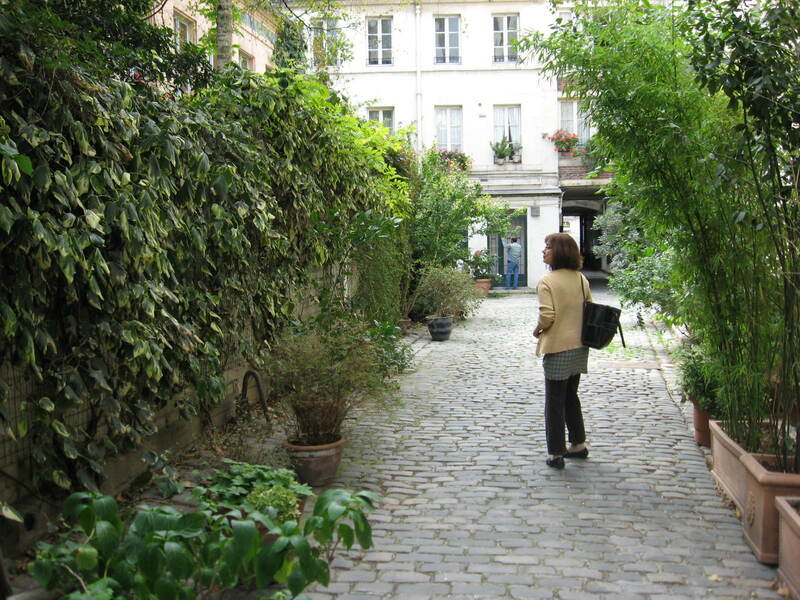 We look forward to visiting the many other neighborhoods and gardens of Paris we have not yet seen!